Thanks to Diane for the guest post. I wasn’t in the mood (and didn’t have time) to write last week because I was busy nursing my boyfriend who was victim of a hit-and-run car accident. He’s ok now, even if he can’t move a lot around, his foot being in a cast. I think it’s a coincidence but this week’s songs are really sad though they will make you travel on the trails of the Texas cowboys and the herders of the steppes of Tuva. Arthur Miles, a Texan cowboy, created in the 1920s a style of overtone singing, similar to the sygyt style of the steppes of Central Asia (see below). He recorded Lonely cowboy (part I and II) in Dallas around 1927 for Victor. He is the only artist I heard until now who can yodel and throat sing in the same song ! Both songs are really gloomy, and so are the yodels and throat singing. There’s not a lot of info about him but on this page, you’ll find a very interesting interview of Pat Conte (from the Secret Museum of Mankind cd’s) speaking about Arthur Miles. There’s a modern interpretation of the song by stigandr aka big bro Clifton on youtube, with the lyrics of part II. Throat singing is a technique “in which the singer manipulates the harmonic resonances created as air travels from the lungs, past the vocal folds, and out the lips to produce a melody” (definition from wikipedia). 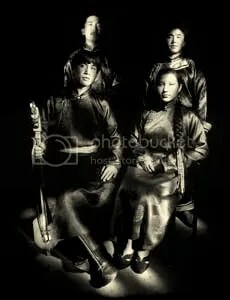 It is mostly known from the singers of Mongolia or Tuva but it is used in all parts of the world like Sardinia, South Africa or by the Inuit people. There were other artists who did something like overtone singing: Richard Burnett from Kentucky is one of them and you can hear it a little bit in Ladies on the Steamboat, where he plays banjo and Leonard Rutherford plays fiddle in old time style. It sounds more like “dingdongdingding” but some sources (listen to Pat Conte) say he could do the throat singing, he just never recorded it at the time. The song was issued in 1927 on Columbia. You can see them on the first picture. To end this post, I’ll travel to the other side of the world with one of my favourite Tuva songs, Igor’s solo by Chirgilchin (on the second picture), on their Collectible album. Igor Koshkendey has mastered six different styles of throat singing, is inventing some more himself and has won the Grand Prix of the International Throat Singing Competition in 1998, 2000, and 2002. This song is very sad, just with the bayan (russian accordeon) and you feel transported far far away in the steppe when listening to it. Hello,i am astonished to read that you have not heard of Christian Zehnder from Switzerland ,formerly part of “Stimmhorn” who combines throatsinging and yodeling and and did perform with the Tuvan stars Huun Huur Tu and appear in a documentary about them too.I am very happy to stumble upon this blog since i am huge fan of yodeling and other strange things you can do with your voice and went straight to amazon to buy your book ,the rough guide and an instructional how-to book with cd to learn yodeling finally. Thank you for the songs and inspiration! Do they yodel in Croatia ?